Contract growing rates for Landcare groups or individual orders. To meet increasing demand from commercial customers, we now provide a plant brokerage service, in addition to growing plants on site. 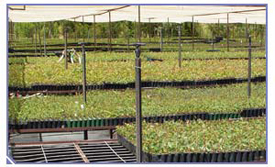 Our wholesale network can source any plant and we maintain this stock at the Nursery until the customer requires it. This service ensures the plants are on-site when needed for a particular job. Our network of capital city wholesalers, ensures the best prices are quoted when sourcing any size of plant – from advanced 100 litre containers down to cell grown grasses.